This is a feel good book that evokes a range of emotions. There is tenderness and romance, sass and farce, and lots of mishaps and comeuppance. With quick brushstrokes that are spot on perfect, Banister brings to life peripheral characters that cut to the core and bring a chuckle. The story is about finding love and soul mates, family reconciliations, and self-discovery with lots of fun, plot twists, and sheer enjoyment along the way. There are delightful canines to warm our hearts as they reveal plot intrigues via “talks” with Willa. It was easy to fall under the spell and believe that Willa could communicate with dogs. Banister is an accomplished writer who manages to weave two romances into a delightful, charming story that breezes along yet carries serious themes without hitting the reader over the head. The way she alternates first person chapters between Willa and Sloane is masterfully done and keeps tension high. There is a lot of heart in this book and in the characters. The underlying love and connection between the sisters is beautiful though they are so different. We see the pain of past loves and then the joy when it turns out right. Banister makes us believe the reality of the characters, their situations, their emotions and yet keeps us laughing and turning pages, eagerly looking forward to the mishaps along the way, knowing there will be a happy ending. 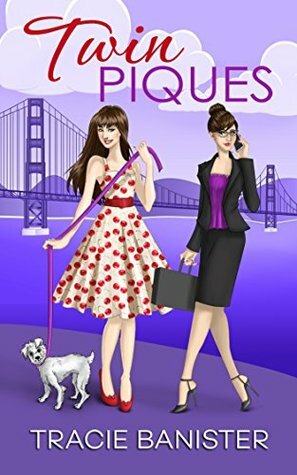 There is plenty of realistic detail to anchor the story: the San Francisco setting, the professions of forensic accounting, graphic artist, and rosarian, the corporate and legal world. It is an enchanting place with people I would love to meet. I look forward to reading more by Tracie Banister including her two previous books.